The Wabanaki people include the tribes historically located in the Northeastern United States, Quebec and the Maritimes: the Penobscot, the Passamaquoddy, the Malecite, the Mi'kmaq and the Abenaki. In the centuries before contact with Europeans, moose hair, porcupine quills and paint were used to decorate clothing made from skins. Once trade was established in the 1600�s, hide clothing eventually changed to cloth and wool, and glass beads and ribbon were being incorporated into native styles and designs. Not only was beadwork decorative, but often times had specific meanings carried in the beadwork much like the reading of a wampum belt. 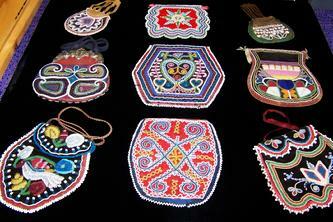 Often too, certain beadwork designs were seen as sources of protection and aid to the wearer. Although the materials and technologies changed, many of the original designs remained the same and were carried on to the next generations of bead workers. ancestors, were schooled by nuns in Quebec, and encouraged to do and sell such handiwork. Although the selling of these purses was a matter of economic survival for these Native peoples, they still incorporated traditional design motifs and sacred symbols in their beadwork. 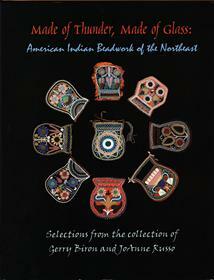 In 2006, I saw the �Made of Thunder, Made of Glass� exhibit of beaded purses at the Abbe Museum, Bar Harbor, Maine. 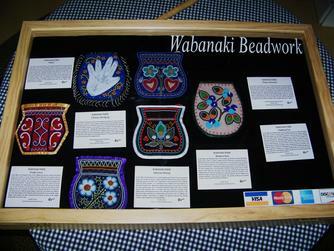 I was fascinated with these beautiful little purses made so long ago by Wabanaki hands. 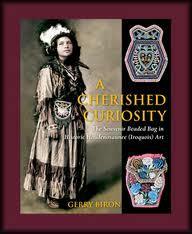 The exquisite craftsmanship and individuality of the beadwork designs inspired me to want to revive this style of purse. Although my unique purses are not reproductions, they are made in the same manner and style as the old purses. Through this mix of old and new, traditional and contemporary, I hope to honor those who have gone before me and give to those in the future.